For years, Pilates was an exercise technique synonymous with toned, lean bodies. However, the primary benefits offered by Pilates go beyond just flexibility and core strength. In addition to the appealing aesthetic benefits, when you implement a Pilates routine into your life, you will see many other benefits as well. The surprising benefits offered by Pilates make it an effective, plateau-busting routine that can help you reach your goals, while improving your overall health. Interested in learning exactly what Pilates has to offer? If so, keep reading. The PilatesPal online resource offers even more information on the benefits of this exercise for those interested. According to statistics, more than 54 million adults in the United States suffer from low bone mass and osteoporosis. By 2030, this number is expected to exceed 71.2 million people, which is a 29 percent increase from 2010. With Pilates, you can actually help to build your bone density. Bone is similar to muscle. It’s a dynamic tissue that responds to weight-bearing and resistance exercises. Resistance exercises involves your muscles pulling on the bone, creating tension. This is what helps to fortify the bone. In Pilates, resistance is achieved from resistance bands and apparatus springs. 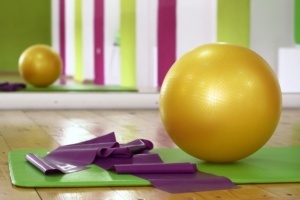 These are both considered staples when participating in any Pilates exercise routine. To lose a single pound of weight per week, you have to have a deficit of 500 calories per day. Pilates can help with this goal. When you participate in Pilates, you are burning four to eight calories per minute, depending on the intensity. If you do these workouts four days a week for 45 to 60 minutes, you can achieve noticeable weight loss. Are you one of the millions of people around the country who suffer from chronic back pain? If so, Pilates may be just what the doctor ordered. Pilates works to strengthen your core, which supports your back. It also teaches proper alignment and offers gentle stretching if your back feels tight. Pilates can also address underlying imbalances that lead to back pain and poor posture. When you participate in Pilates on a regular basis, it will effectively improve your balance, increase your strength and improve your flexibility. All these factors help to reduce your risk of injury. If you increase the flexibility of your hamstring by about 10 degrees, you are going to be much less likely to hurt your back when bending over to pick up something resting on the floor. When you improve your strength, you also improve your dynamic control of movement. This minimizes the possibility of injuries. Also, unilateral, one-sided or one-legged moves in Pilates can help improve balance while reducing the likelihood of a fall. Pilates, over time, can also improve your body awareness. This helps to create efficient movement patterns, reducing the stress on joints, muscles, ligaments and tendons. Regardless of if you want a serious six-pack or just a flat midsection, Pilates can help. In fact, this exercise routine can take your abdominal workout to the next level. This is because many of the movements used in Pilates rank higher when it comes to muscle activation than just traditional crunches. As you can see, Pilates offers a wide array of benefits. Many you may not have even been aware of. If you are looking for a way to improve your overall fitness level, while exercising, Pilates is the answer. Try it out to see how it can help you achieve your goals and improve your health.